I found Santhiramohan's headless body lying naked in the field. I ran to his house and told his wife that the soldiers had killed him and lopped off his head" said a boy who was herding goats by the field where a Tamil youth was beheaded by Sri Lankan army soldiers on Wednesday in the village of Sithaandy, 24 kilometers north of Batticaloa. The boy said that Santhiramohan had fallen on the ground, hit by a bullet, when the soldiers had opened fire towards the field where many people were working at the time. The others had run for cover and hidden in the shrub nearby. The soldiers had questioned Amikapathy and her mother who had also come there about the corpse; taken down notes and then chased them away from the spot. The soldiers then took the body in an army truck to the SLA camp at Morokkoddaanchenai, three kilometers north Sithaandy, on the main road. Ambikapathy and her mother had followed the truck to the camp and had begged soldiers on duty at the camp's entrance to give them Santhiramohan's body. The soldiers had scolded the wailing women and had tried to chase them away from the camp. But Ambikapathy and her mother had persisted, despite threats by the soldiers in the camp. Later they were told to go and seek the body at Eravur, about ten kilometers south of Sithaandy. The acting magistrate for Batticaloa held an inquest yesterday into Santhiramohan's death at Eravur. 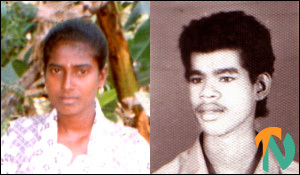 Ambikapathy and her mother said that they are scared that the army might harm them if they were to give further evidence on Santhiramohan's murder. "We are very poor and defenceless" said Ambikapathy's mother. Santhiramohan, 20, was the eldest in a family of three. He had stopped going to school early to fend for his poor family. Ambikapathy who married him four months ago, however, had studied up to grade nine.